There are few flowers that are as romantic and pretty as a pink peony. 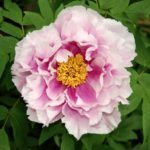 Even if you are a fan of this popular perennial, you may not have realized that there are several varieties of pink peony flowers. From bright pink to pale, almost white pink, and everything in between, you have your choice of pink peonies. Peonies are large and showy flowers that grow on small shrubs with attractive green foliage. There are two main types: an herbaceous peony dies back each year, while a tree peony has woody stems that remain even while the leaves drop in the fall. Both types produce similar flowers, with many varieties in pink. To grow peonies in the garden, make sure they get about six hours of sunlight per day and soil that is neutral to slightly acidic. 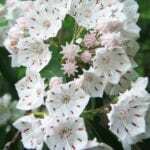 It is best to plant these shrubs in the fall and to water deeply every week until the roots have become established. Use a fertilizer in early spring. Cut flowers off when they are spent and cut back stems on herbaceous peonies in the fall but not those on tree peonies. Big Ben. This variety produces extra-large flowers that are a deep and rich dark pink in color. Angel Cheeks. The flowers on this peony are the palest pink with a double-bloom form. Bowl of Beauty. As the name suggests, these blooms are bowl-shaped with darker pink petals on the outside and a cream to white center. Blaze. Blaze is striking with two to three rows of bright pinkish red petals and a cluster of yellow stamens in the center. Candy Stripe. For a pattern on your pink peony, try Candy Stripe. The flowers are double-bomb in form and the petals are white streaked with magenta. Do Tell. This flower has a few rows of pale pink, almost white, petals surrounding a cluster of magenta in the center. Fairy’s Petticoat. For a large, highly ruffled peony, choose this one. The color is pale to medium light pink. Gay Paree. One of the showiest of pink peonies, Gay Paree, has bright pink outer petals and a pale pink to cream cluster of ruffled petals inside. Myrtle Gentry. This peony will give you a stunning bloom with an outstanding fragrance. The flowers are pale pink and rose-shaped, fading to white with age.